Potatoes are my favourite food. My potato obsession was elevated to an even greater level when I discovered that I could slow cook baked potatoes. I haven't used the oven to make baked potatoes since. White potatoes have had a bad rap nutritionally over the past couple decades, but they are high in fibre, packed with potassium, and they are the highest ranked food on the satiety index (a measure of how long a food keeps you feeling full). Potatoes are your friend. 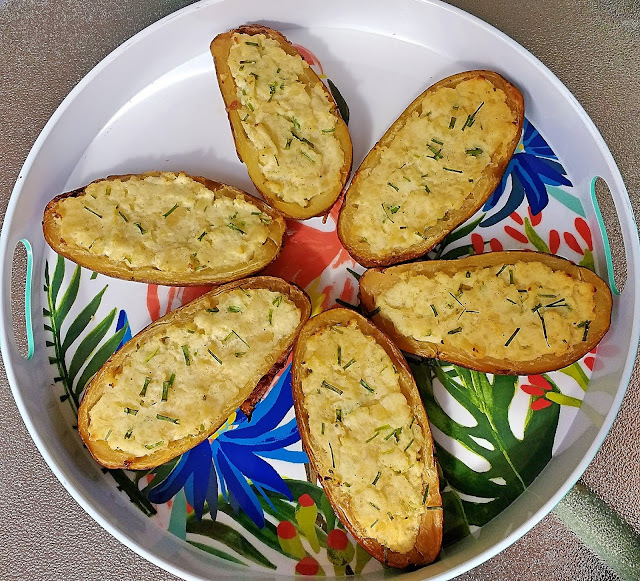 To make the twice baked potatoes, use the slow cooker potato recipe listed above first. Remove them from the foil, and place them on a cooling rack for an hour to cool down. It's fine if they are lukewarm when you start making the twice baked potatoes. Slice potatoes in half lengthwise. Scoop out the potato flesh, leaving a 3mm border alongside the potato skin to maintain the structure. Place the scooped out potato flesh into a medium sized bowl. Use a potato masher to break up the potato chunks. Add goat cheese, chives, olive oil, and salt and pepper to the bowl, and mash again. Scoop the goat cheese mixture back into the potatoes, packing it in. Top with additional chives and black pepper. Place on the top rack of the barbecue to crisp up the potato skins and melt the cheese, or place in the oven at 350 degrees F for 20 minutes, until tops are lightly browned. Serve immediately.